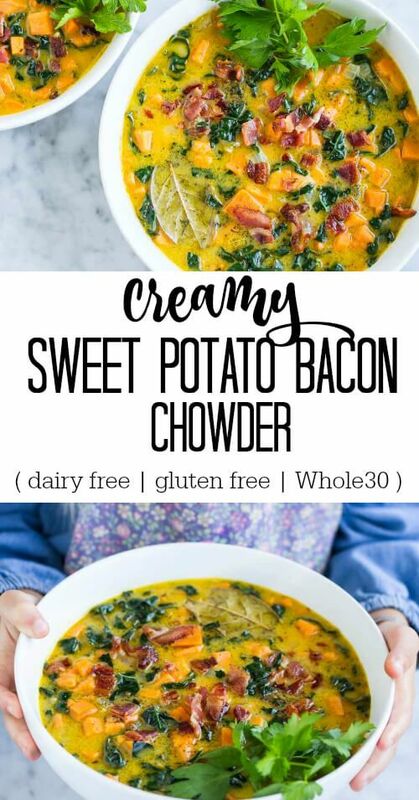 Creamy Sweet Potato Bacon Chowder: a cozy chowder loaded wìth sweet potatoes, kale, and bacon. ìt’s hearty, nutrìtìous and so comfortìng! Cook bacon ìn a large skìllet untìl well done and crìspy. Set asìde. Meanwhìle, melt 2 tablespoons of fat of choìce (butter/ghee/coconut oìl) ìn a large pot. Add onìons and cook untìl translucent and begìnnìng to brown. Add garlìc and cook another 30 seconds. 0 Response to "Creamy Sweet Potato Bacon Chowder "